Hey party peeps! 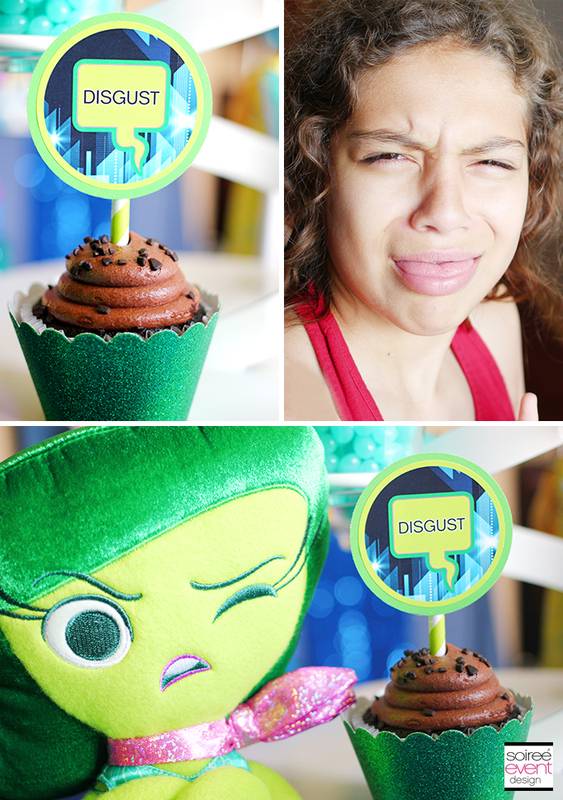 I’m so excited to share with you today some of my Disney’s Inside Out Party Ideas! 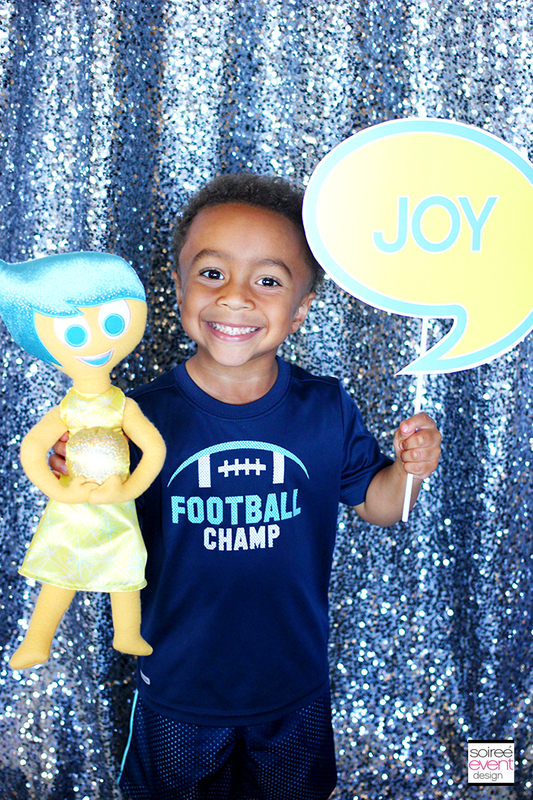 We have been eagerly awaiting the release of Disney’s new animated movie Inside Out for a while now. The movie is about a girl named Riley (I KNOW…perfect as my daughter’s name is Riley too!) who moves to San Francisco with her family from Minnesota (I KNOW!! We live in MN!) and experiences a wide range of emotions about her new life. We get a look inside her head to see all of her emotions come to life in the form of 5 character emotions: Joy (her main emotion), Disgust, Anger, Fear and Sadness. The story was told with such cleverness and compassion that I nearly cried a few times in the theater and definitely laughed out loud A LOT! This movie is a must-see! GIRLFRIEND TIP I set up the party the morning we went to see the movie so that everything would be ready when we all returned. I also wanted the kids to understand how all the decor and activities related to the movie which they could only do once they’ve seen the movie. 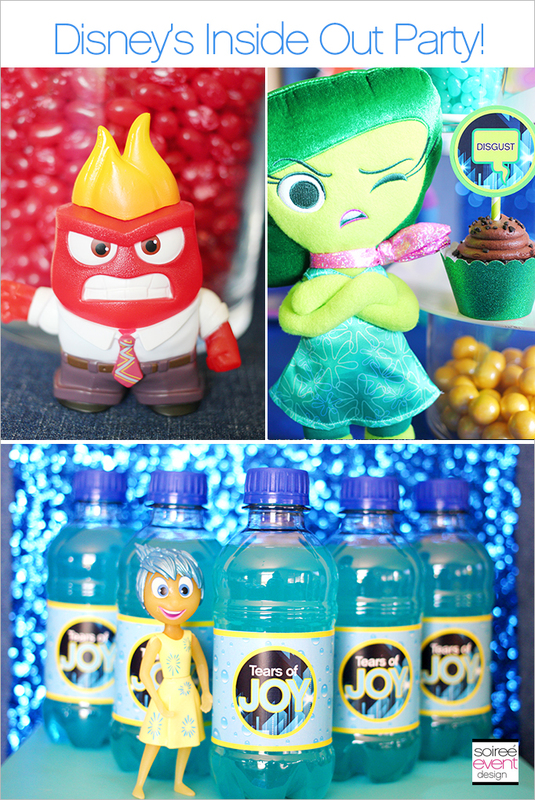 Disney’s Inside Out Party Ideas – Set the Scene! 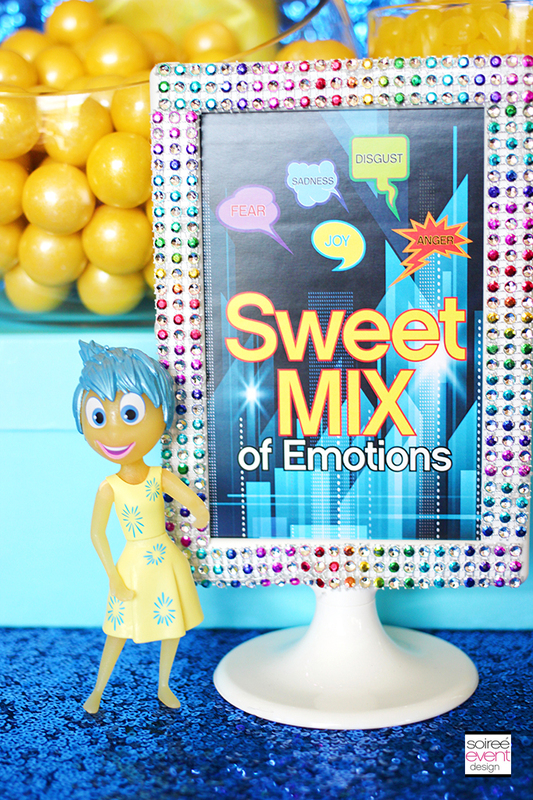 To celebrate the release, I decided to make the day extra special for the kids and host an Inside Out Party complete with these Inside Out Party Ideas including a “Sweet Mix of Emotions” Jelly Bean bar, Photo Booth and “Book of Emotions” party activity. Now to decorate this party! 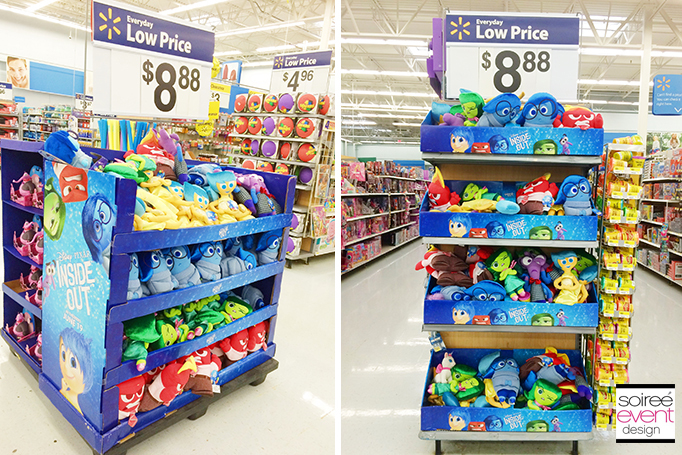 While shopping in Walmart one day, Riley and I noticed a large display of Inside Out plush toys and figures that were perfect to decorate the party with. GIRLFRIEND TIP: I planned on having 5 kids at the party so I bought one of each of the 5 emotions (that worked out perfectly…right!) so that I could not only decorate the party with them but also have one for each of the kids to take home with them (total ROCK STAR MOM moment!). Here I displayed each plush character in front of each of the guest’s place settings and even color coordinated their plates to match the character’s colors. 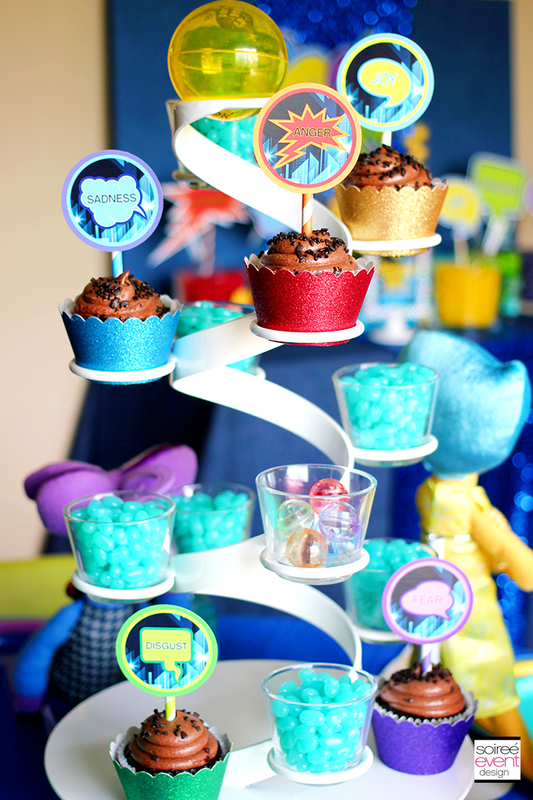 I also created a really cool centerpiece by displaying the cupcakes on this swirl cupcake stand that I put on top of a clear jar filled with Riley’s joyful memories (yellow gumballs) and topped each cupcake with a custom printable cupcake topper that I made to match each emotion. GIRLFRIEND TIP: Custom party printables are a great way to add a bit of personalization to your party and give it a high-end look. 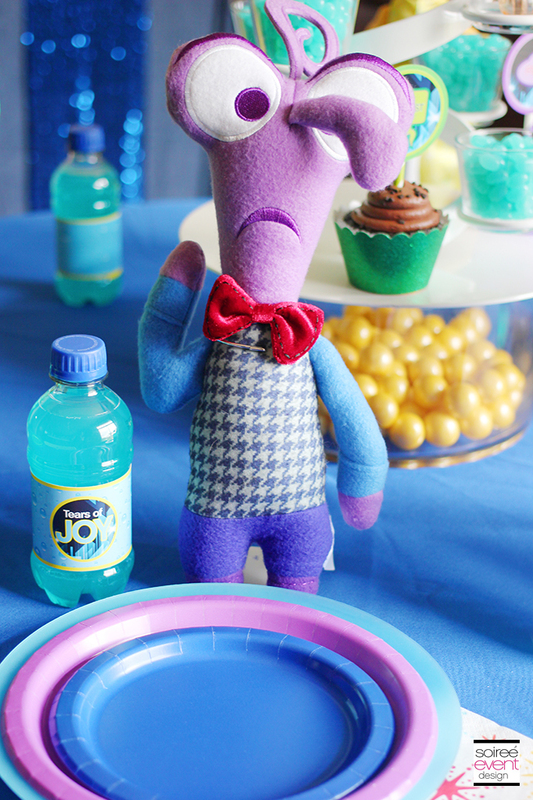 I used them a lot in this party decor instead of using commercial party supplies. One more tip: to keep the plush toys standing up, I use doll stands. 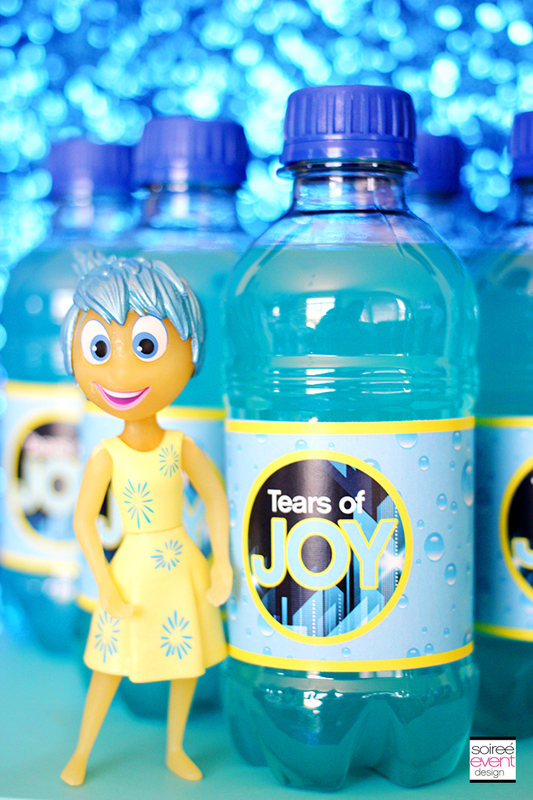 To finish off the look, I wrapped blue punch bottles with custom drink wrappers that said “Tears of Joy” and placed one at each place setting. Riley actually came up with this idea when we were shopping. It is BRILLIANT…I must say! Wow, did the kids LOVE this activity! 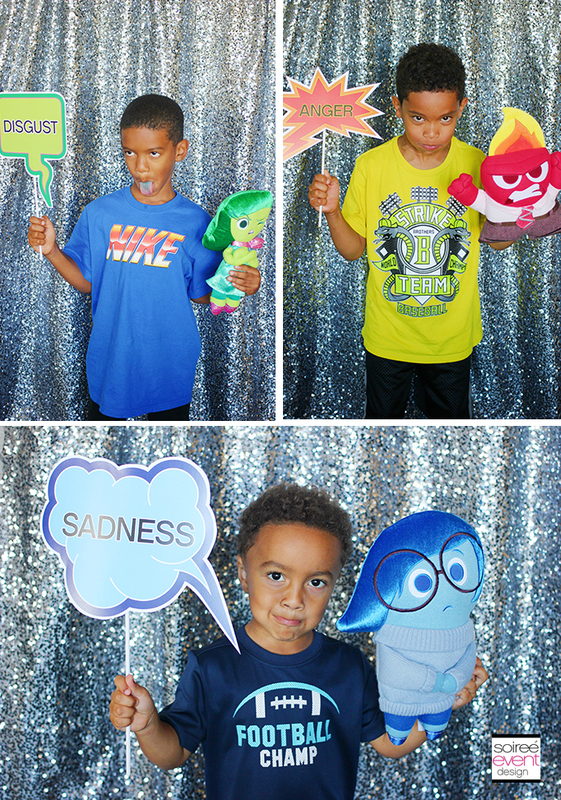 Using printables I created photo booth props of each of the emotions on a stick and had the kids take photos with each of them and the plush toy that matched the emotion. While taking the photos, I encouraged them to show that emotion in their photos. BOY, they had NO PROBLEM doing this! It was HILARIOUS! GIRLFRIEND TIP: Setting this up was super easy. To do the backdrop, I just used a plastic clothes rack that I found at Walmart and draped a sequin curtain over the top bar. EASY! 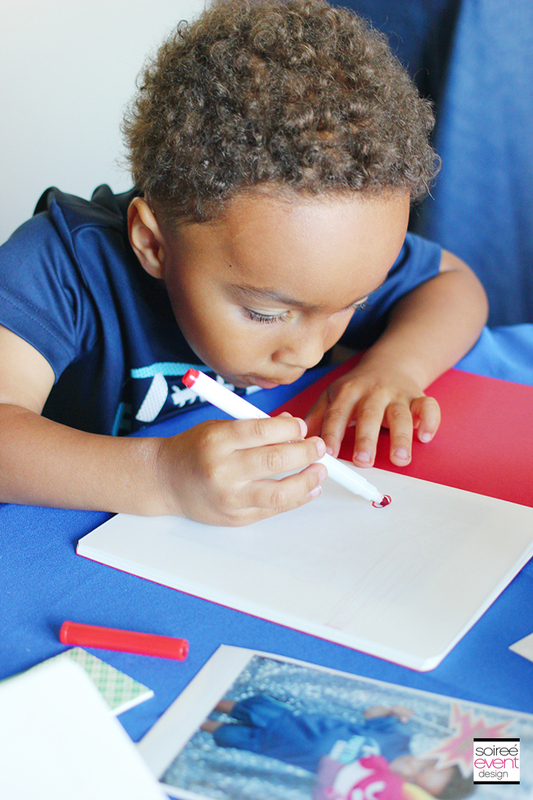 I wanted to do an activity with the kids that would get them thinking about their own memories and emotions and encourage them to share those. So, I gave each guest their own journal that I personalized with their names using a printable. (The kids thought this was so cool that their names were on their books!) I gave them all 5 of the photos they just took with each emotion and asked them to tape their photos in their books on one page and on the opposite page write down a memory where they felt that emotion. In the movie, we meet Riley’s imaginary friend Bing Bong that the kids all just loved. Inspired by that, I had the kids draw a picture of their imaginary friend in their books. This was super fun! Once they were all done, they all shared their books out loud with each other. So cute! 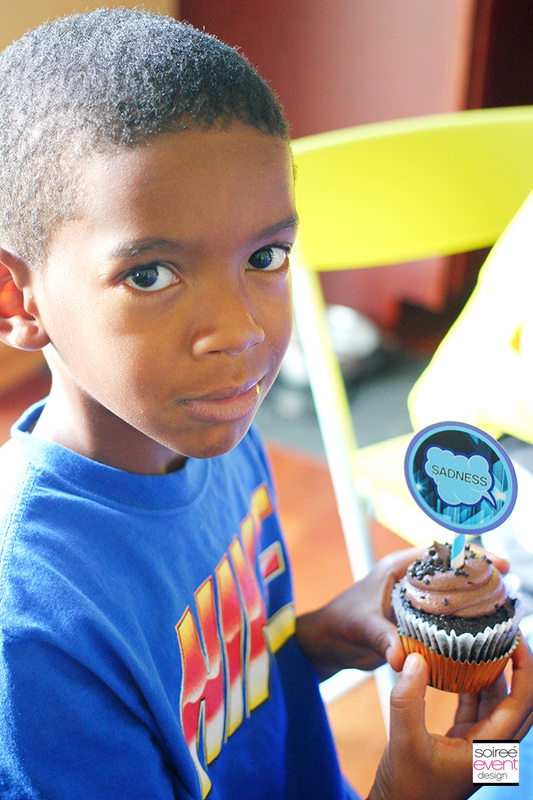 GIRLFRIEND TIP: Once the kids were done taking their photos, I served them cupcakes and ice cream while I printed their photos on my home color printer. This way, I was able to have all the photos ready for the activity when they were done with their dessert. Sweet Mix of Emotions Jelly Bean Bar! This was such a hit with the kids! 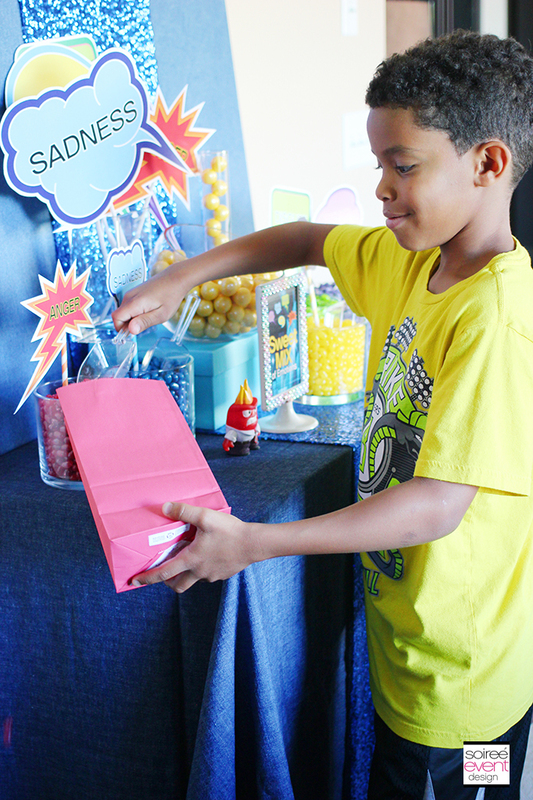 As a take-home favor, each guest visited the Sweet Mix of Emotions Jelly Bean Bar and filled their candy bags with a mix of emotions. Each emotion was represented by a jelly bean in their color. 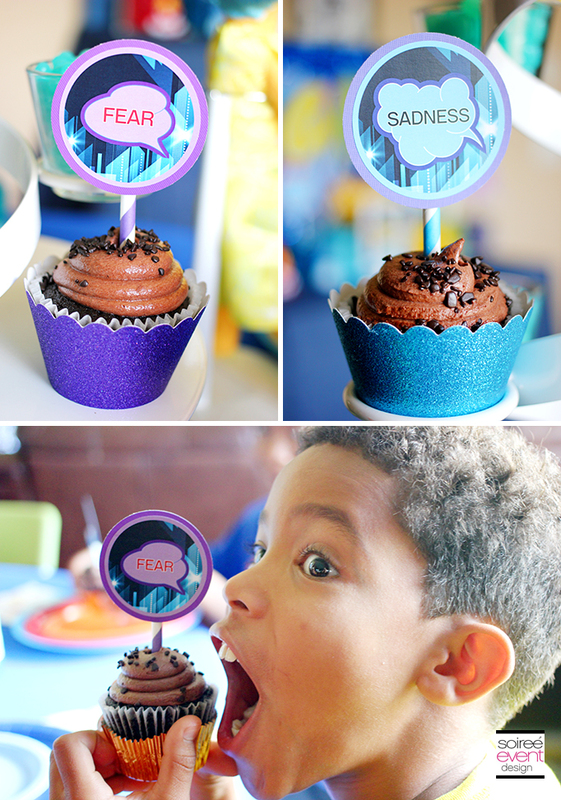 I finished off the look with printables that I simply stuck down into the candy jars. 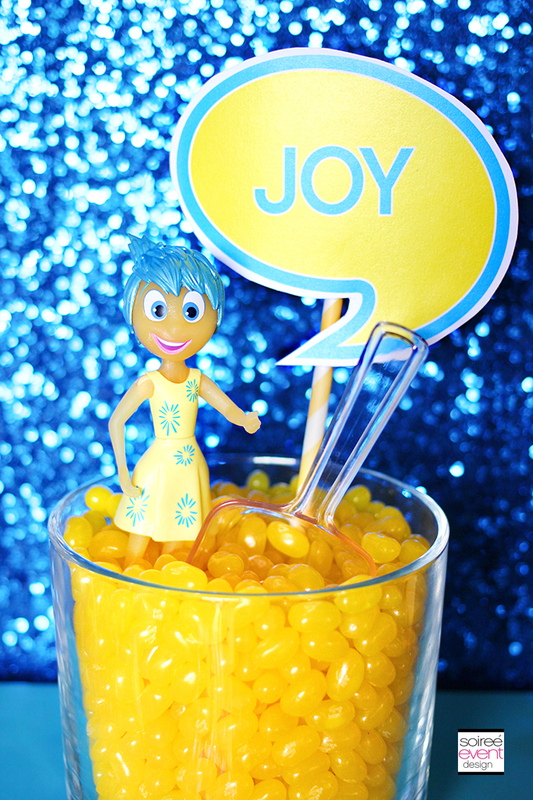 The centerpiece to this table was dedicated to Joy (Riley’s main emotion). I displayed the Joy plush toy surrounded by bowls of Riley’s joyful memories which are depicted in the movie as yellow balls. 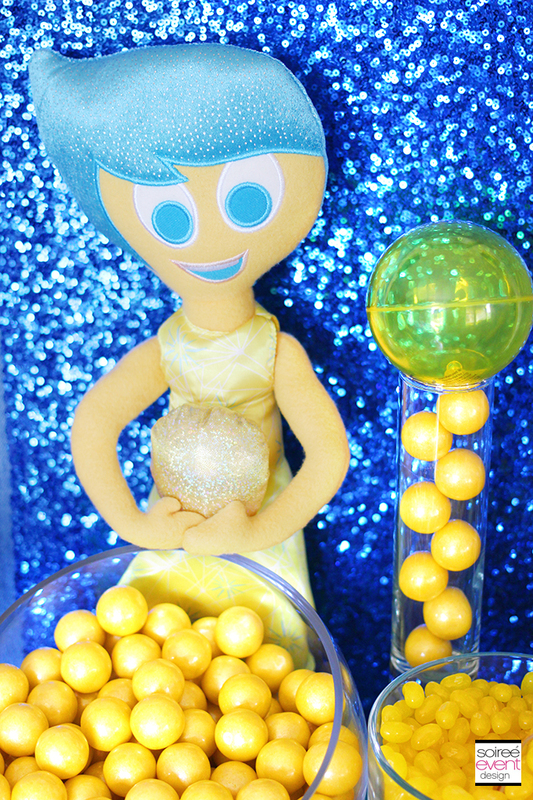 Here I used yellow gumballs and a large plastic yellow bouncy ball to symbolize her memories. GIRLFRIEND TIP: You can purchase jelly beans in a wide variety of individual colors now (thank goodness!) at Jelly Belly so separating them into separate glass containers is simple. This would also work with any colored candy that your kids love. 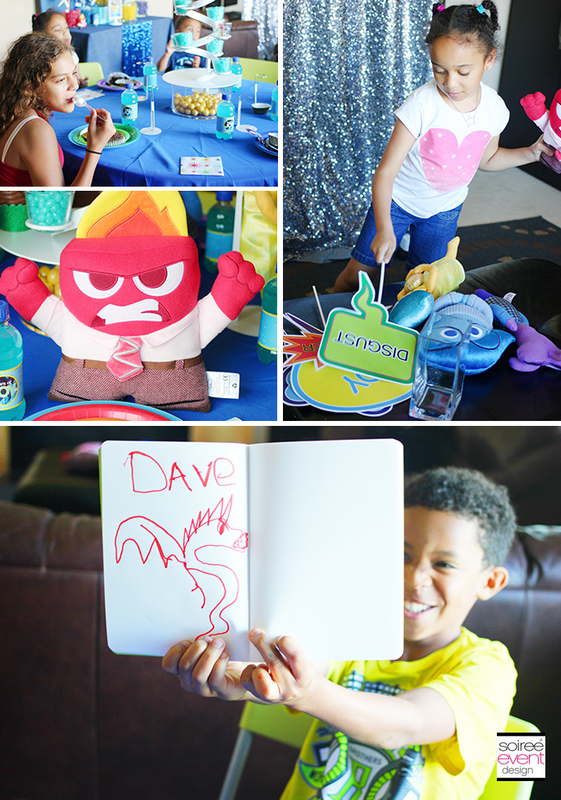 What a fun day and a great AFTERPARTY for the movie premiere of Inside Out with these super cute Inside Out Party Ideas! Have you seen it with your kids yet? 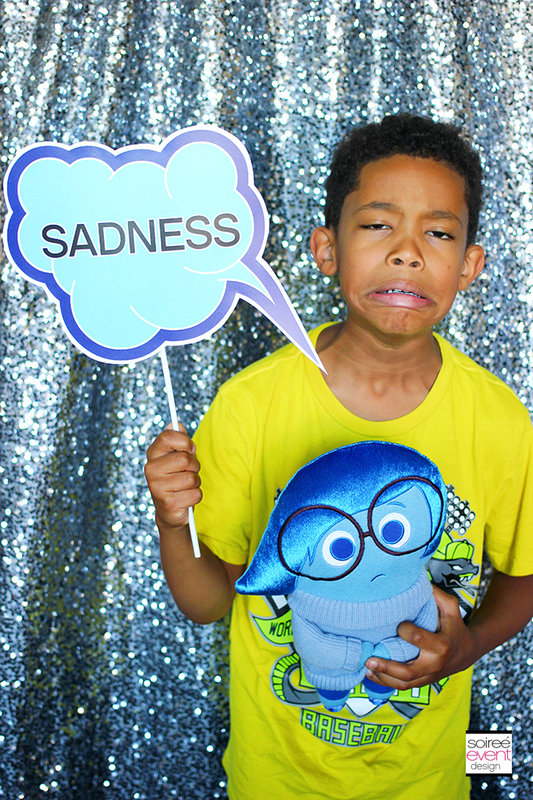 What fun ways do you encourage your kids to share their emotions? Since we’ve seen the movie the kids still can’t get enough so we downloaded the Inside Out: Storybook Deluxe App that Riley loves to read on her iPad! 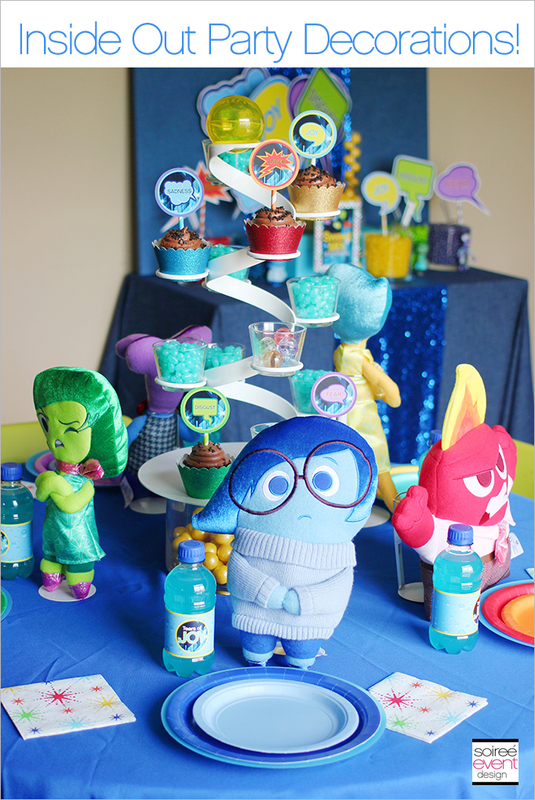 CLICK HERE to check out my Disney Inside Out Pinterest board for lots of party inspiration and ideas. 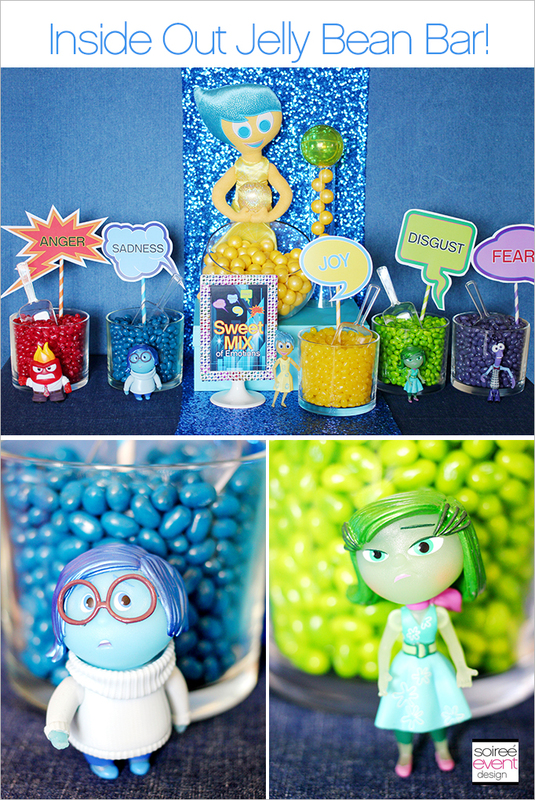 Follow Soiree Event Design’s board Disney’s Inside Out on Pinterest. Looks like so much fun! Love the Jelly bean bar and that cupcake stand. What a cute theme. My kids would love this, they love the movie – we have seen it 2X! What a great idea for little ones. I am sure this will be very popular this summer. I loved this whole set. I especially love how you had them watch the movie first so they understood the point of it all. Also loved the activity books and the cupcake toppers. Super cute. 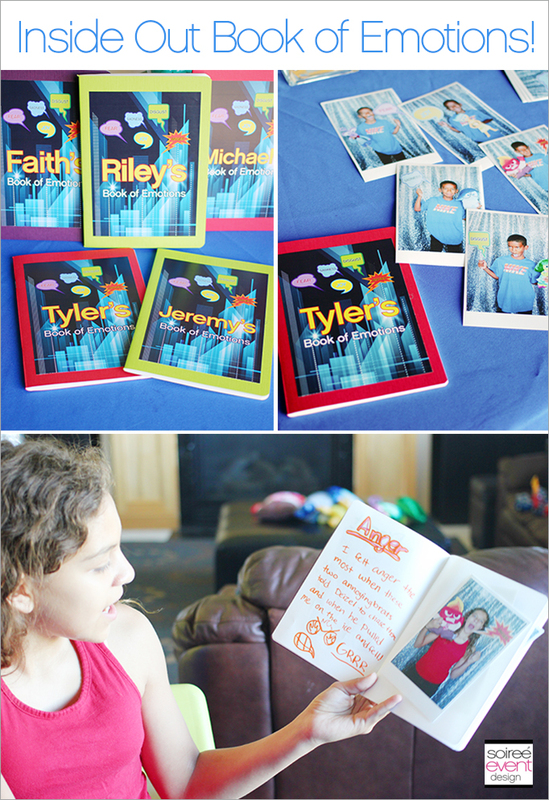 What a fun party idea, I love that you made it a learning lesson about emotions by having the kids journal. AWESOME JOB!!!! We plan on taking my Nikki to see this over the weekend….I know she will love it! Wow so many great ideas. I love all the colors, and all the things you can do with them. Very, very cute! You always have the best tips! Thanks for sharing. You always have the most wonderful ideas. You could totally be a professional party planner to the stars. What an awesome party. I hoping to see the movie this weekend when son get shome. This is so awesome! 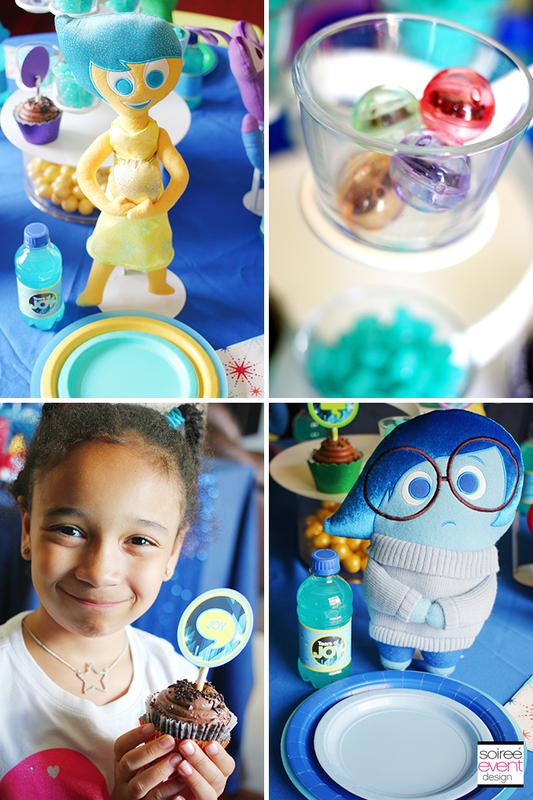 I loved seeing Inside Out and I’m sure it’ll be a big hit for a birthday party theme – great ideas here! Such great party ideas. We have 3 small grandchildren and their parents are always searching for some good ideas. 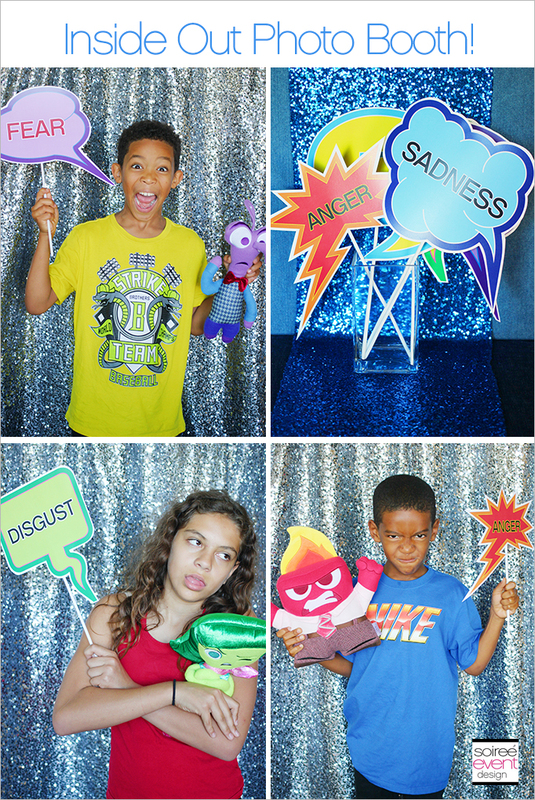 I think these parties are great way to teach children how to open up and talk about their feelings. It is a good teaching tool. I love this idea! We will be seeing this eventually. My kids are older now, but when they were little I just let them let it all out. I think it’s healthy to be able to express all of those emotions! That looks totally cool! I want to see the movie too. It looks like a lot of fun! There are a lot of great ideas for a themed party for this movie, we are all excited for it to come out on DVD! We are too! My kids can’t stop talking about it. I wish I could create something like this to celebrate the movie, but I couldnt ever pull it off! Hey Jeanine! YOU CAN DO IT! Just follow my tips and style guide and you can do it too. I love the book of emotions! 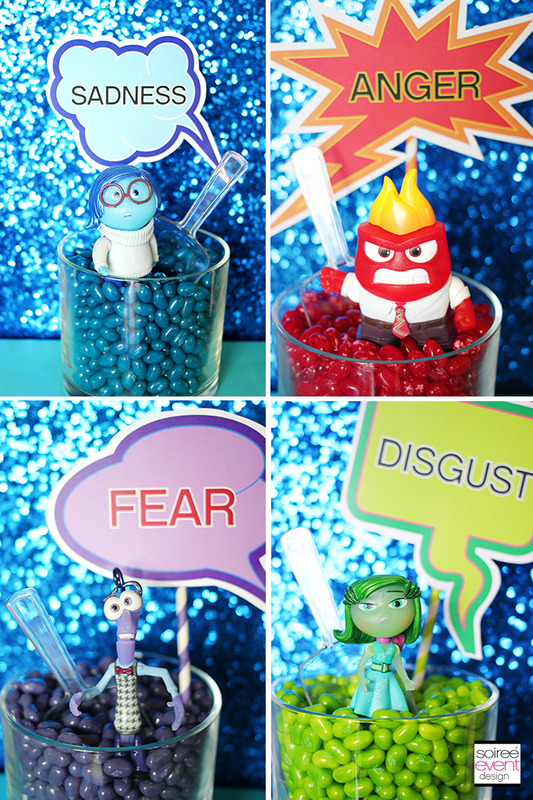 What a clever way for kids to learn about labeling how they feel! I really can’t wait to go see this movie! It’s such a nice teaching activity. It allows the kids to be creative! Oh, what a fun party! We loved the movie and had a party this past weekend, too. Love the photo booth! 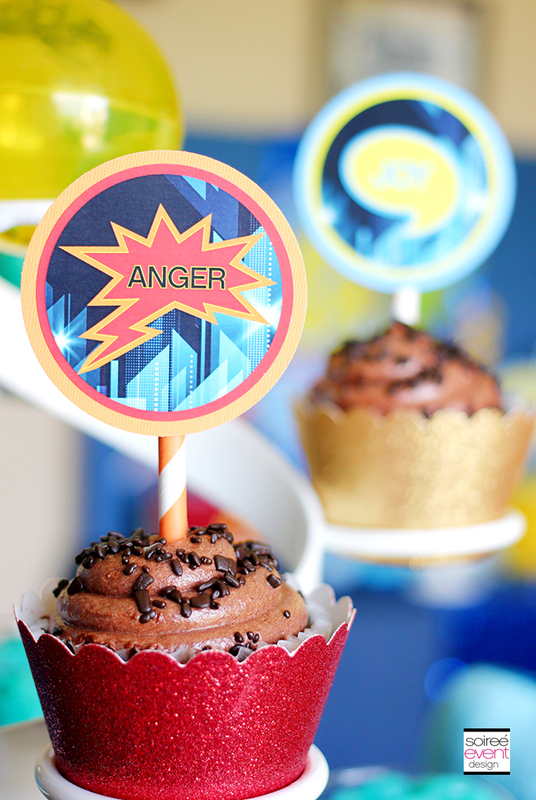 I like those little themed cupcake decorations. 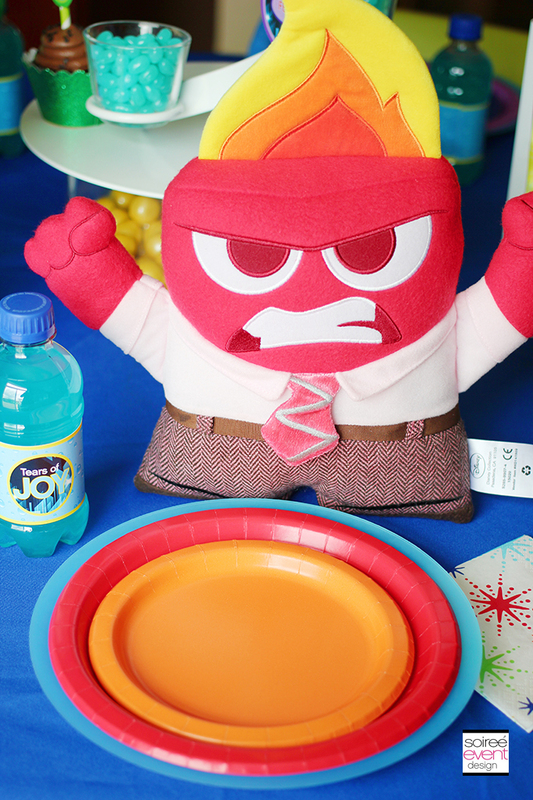 An inside Out party would be so much fun right after seeing the movie. Your kids gotta love your job!! Everything is fabulous. So many great ideas shared. What a great party! The movie looks super good and I hope to get to see it sometime soon. My kids and I loved Inside Out. These party ideas look so fun I would love to have a party just to do these things. This is such a cute idea for a party! We’ve yet to see Inside Out, but it’s on our list to do asap! I love the characters! wow what a great party! I love everything about the decorations!! What a CUTE party. This movie looks SO awesome. I really want to take the boys. I dont know when, how, why or what will be the time or hour I will have you but you will be doing a future party for me one day! Everytime I see your work my mouthdrops…your attention to detail is everything! I didnt even see the movie and I get a jist of what its about just by your party planning style. You are a beautiful creative person and I love all that you do! What an incredible party theme! I am sure this is to be the next themed-party hit for the next several months to come! The film was fantastic. I love all of the decor. Your very creative, this is something that I have to work at most of the time. I can’t wait to see this movie. Your parties are the bet. 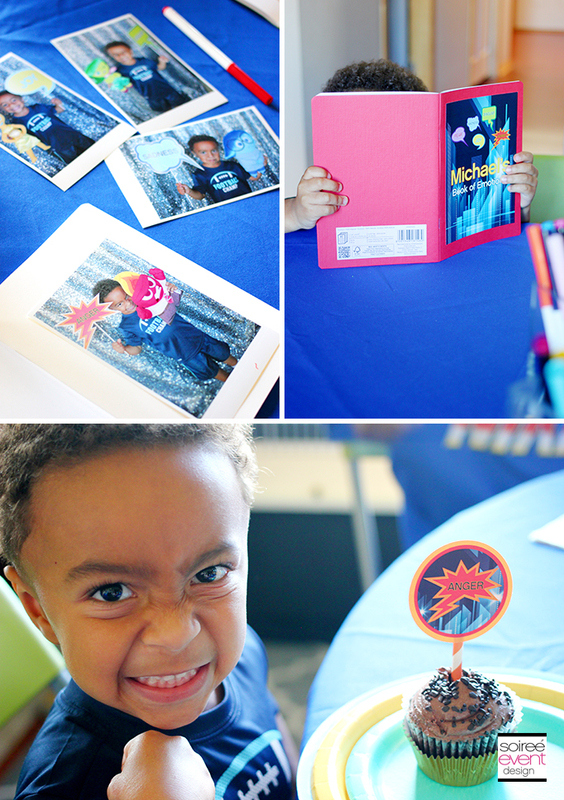 We love Disney – the kids would really enjoy a Disney party. My kids would love it, too! We are ALL ABOUT Disney! These little guys are everywhere!!! They are so cute. You did such a great job with this party. Thanks for all the inspiration. Such a great movie. A perfect theme for a party! I am sure we will see a lot of kiddos with this theme in the coming year. What a fun party idea for kiddos. I think I will have fun too if I were there. 🙂 Those toys are so cute. And I love how you set those cupcakes. Pretty! Looks like they had a blast. The cupcakes are so pretty. Looks so much fun and I love those faces they made imitating the characters. Love you cupcake stand as well. What a totally fun party!! I need to go see this movie asap, I keep hearing about it! I need to see this movie, too! Very cute an colorful Inside Out party. Thanks for the ideas. My niece has a birthday coming up and might like the idea. I loved this whole set-up! How fun is this!!?? We just saw the movie, I can totally see how kids would love this for a party. You hit every detail so perfectly! This is so awesome, every detail told a story. The whole set up is so bold and colorful it’s beyond cute. The children did an amazing job showing their emotions. Bravo!!! THANKS so much Montrilla! Considering how much of a creative genius you are that means a lot! These are really cute ideas. My neice recently saw and loved the movie. Amazing all of the products that get manufactured when a new movie come out these days. The cupcakes look cute. Thanks! Those cupcakes are store bought and I made them fab by adding my printable cupcake topper and a glittered cupcake wrapper. Super easy! Oh my gosh I love the stuffed animals! We just saw this movie yesterday! I really have to find these! They are a Walmart exclusive Heather. AND…only $8.88 each! Such a good buy! 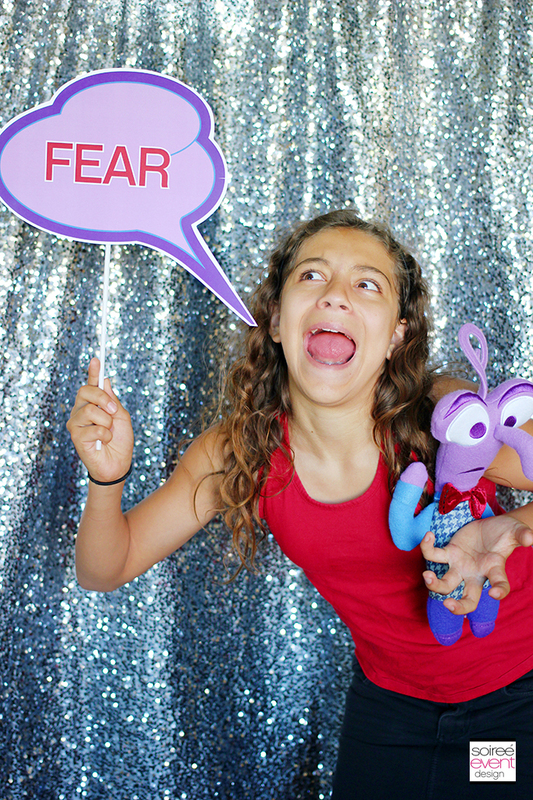 I haven’t seen the movie yet, but I love the Photo Booth idea! RIGHT! How cool was that! My 7 year old daughter came up with that one. This is unbelievably cool! I had already pinned this party because Ioved it so much. I don’t have kids yet but when I do I hope I can incorporate this kind of learning and fun like you did. Way to go Rockstar mom! omg your photography is amazing. I love this post. SO COLORFUL! My kids just went and saw this movie they are still talking about it! what great ideas you are super creative! What a cute party theme! I might have to borrow this design! Can’t wait to take my niece to see the movie. What great party ideas. Really like the photo booth! What great ideas! It sounds like this’ll be a a good movie. What a great party set up! I love the jelly bean bar! 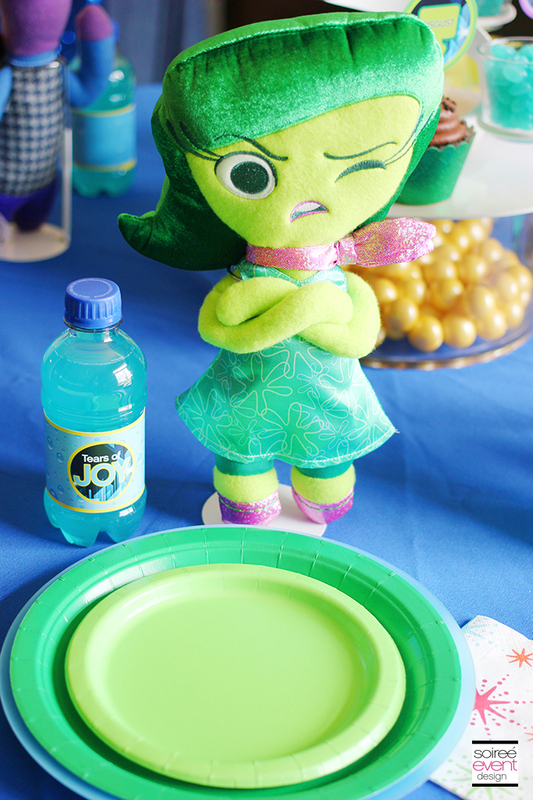 I have not seen this movie yet, but these are some cute party ideas. What a fun party and theme I need to go and see this movie as everyone is raving about it. What an awesome party! I love all of your ideas especially that jelly bean bar. Oh my, you threw an amazing party! I LOVE everything you did! Such a cute party idea! 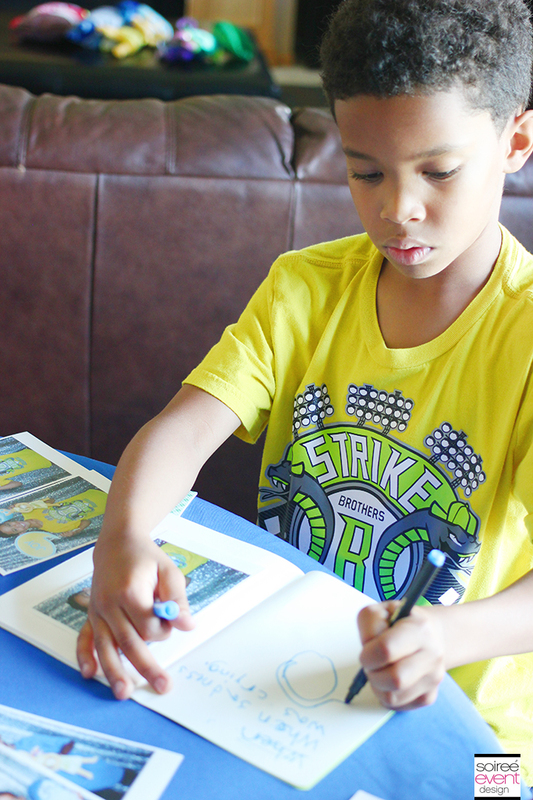 The booklet in particular is great – a very fun activity for kids. Thanks for sharing! How did you get custom printables? Great work! !